Introducing Amourxhandmade Jewellery and a necklace Giveaway ! I personally love jewellery pieces and accessories, and it's evident from my outfit posts. Who doesn't like to sport something really beautiful and original ? I sure do !. Today I wanna talk to you about Amourx Handmade, a lovely handmade webshop run by Colleen, a very nice and talented aussie girl !. She has a true passion for creating unique pieces and in the set above you can see some of the necklaces that caught my attention, I invite you to visit her store and have a look yourself !. Established on Etsy in 2010 by a girl following her passion and creativity and then moving to a website of her own, Amourxhandmade dot com is a webshop I am proud to present you because I got to know Colleen and she doesn't only have a great fashion sense, the whole handmaking process is actually very significant to her, just like she says on her website. She is indeed very motivated to create each piece uniquely and with the utmost care, effort and love. Add to this that her prices are really fair for the quality and care she offers ! That means we can be beautiful staying on a budget and this is another plus !. Colleen doesn't only make beautiful necklaces, she sells earrings, bracelets and other accessories. All the items you see in these sets were taken from her website. What is your fave product ?. I personally love the turquoise bib necklace in the set above, and if you read the whole post, you'll see you can get to win it :-) !. Personalmente adoro indossare gioielli ed accessori, ed è anche piuttosto evidente dai miei post outfit. A chi non piace portare qualcosa di veramente bello ed originale ?. Oggi vi voglio parlare di Amourx Handmade, una deliziosa boutique online curata da Colleen, una ragazza australiana molto simpatica e talentuosa !. Colleen ha una vera passione per la creazione di pezzi unici e nel set sopra potete vedere alcune collane di sua produzione che hanno catturato la mia attenzione; vi invito a visitare il suo negozio per dare un'occhiata personalmente !. Nata nel 2010 su Etsy, portale dell'handmade, su iniziativa di una ragazza spinta dalla sua passione e dalla sua creatività e passata ora ad un vero e proprio sito, Amourxhandmade.com è una piccola boutique che sono orgogliosa di presentarvi perché ho avuto modo di capire che Colleen non ha solo un ottimo gusto, ma l'intero processo della creazione dei suoi gioielli è da lei seguito con amore e attenzione. E' infatti molto motivata a creare ogni pezzo unico e con la massima cura, dedicandosi alla cura del cliente. Aggiungete che i prezzi sono veramente ottimi e giusti per la qualità e la cura offerti ! Possiamo sentirci belle restando nel budget, il che è un'ulteriore plus ! Colleen non realizza solo belle collane, vende anche orecchini, braccialetti e altri accessori. Tutti gli articoli che vedete in questi due set sono stati presi da me dal suo sito. Quale prodotto preferite ?. Il mio è la collana con i turchesi del set che vedete sopra, oggetto anche di una gradita sorpresa per qualcuno... ;-). AMOURXHANDMADE TURQUOISE NECKLACE GIVEAWAY ! 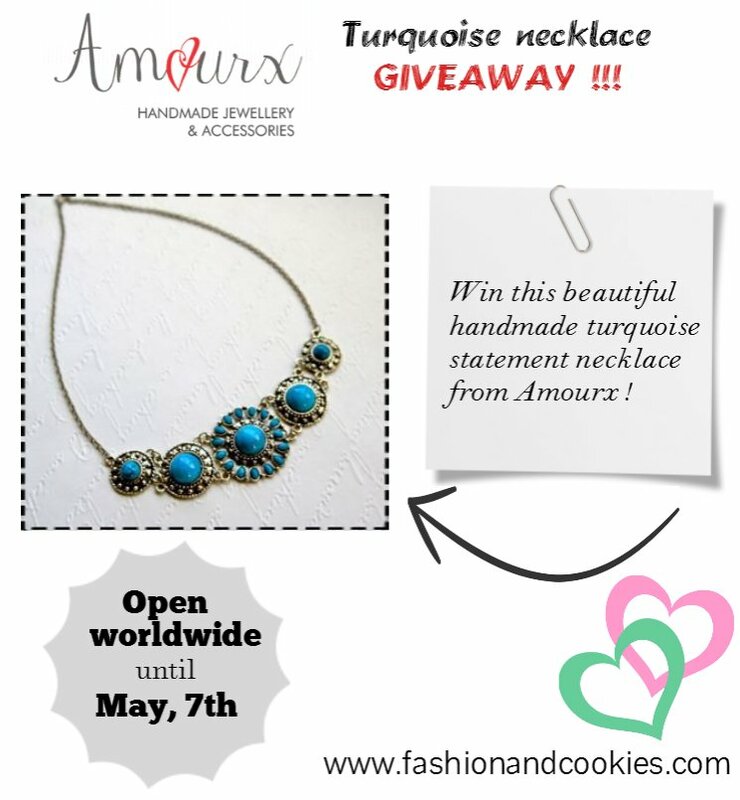 Amourxhandmade dot com is offering this wonderful turquoise bib necklace for a lucky follower of this blog with a lovely international Giveaway, starting today and up until May, 7th !. To enter you have to follow the simple rules you find below and fill the Rafflecopter form, as ever !. The winner will be selected randomly with Rafflecopter and announced on the blog. I will give the name and the e-mail directly to Colleen from Amourxhandmade so she can arrange the shipment of the necklace to the winner ;-). Now, let's go to the Giveaway rules ! Thanks for visit my blog! It´s a good idea to follow each other! I already follow you! Ma li fa proprio lei? 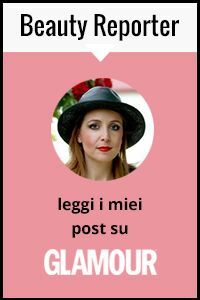 Beata manualità, io queste persone le ammiro, non ho nè la pazienza nè le capacità di fare una cosa del genere! Direi che preferisco la collana nera del primo collage ! And here's my review dear Vale! Really thanks for the opportunity! che bella la collana turchese! I think the Bird Nest and Sparrows Necklace - Gold/Cream is so stunning and meaningful. absolutely in love with this necklace! My favorite product from Amourx is Mini Rose Stud Earrings - Fiery Red.